Skiers are in a constant struggle to "get forward", but what does it mean to be forward? Being forward means being in a position to apply pressure on the tips at will. 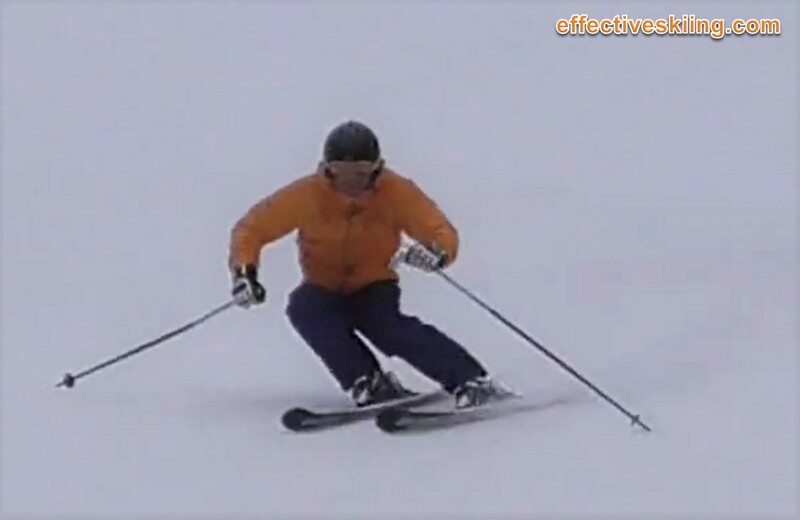 This is not always along the length of the ski, except in relation to the forces of the turn and movements of other parts of the body. See Getting forward and Fore-aft and pressure for a complete review. The common internal cues for being forward are pressure on the shins (from the boot tongues) and pressure on the balls of the feet. In relation to the phases of the turn, we should be forward at the top of the turn, since this is where we try to get the tips to engage and start a turn. Staying forward at the bottom of the turn is good for speed control. Racers are in a continued struggle to stay forward (keep the skis under you) because that affords the most options for control. One thing that is important to note is that forward along the skis is just one component. The more the skis come across the slope in short/medium turns, the more "forward" is also across the skis, as the body moves down the slope, anticipating where the skis will be when they'll need tip pressure. There are many factors that dictate how forward we should be on a certain pair of skis, including the ski design, boot choice, binding mounting points, body shape etc. Hint: although shaped skis don't require a lot of forward pressure, a stiff WorldCup GS ski is the best forward detection device: it will turn if you're forward and it will not turn if you're not. On piste skis have camber and sidecut to allow easy tip edge engagement. The easier it is to get edge engagement, the less forward we need to be for a given turn shape, which is why on easy slopes we can get away with cruising in whichever way. Firm snow conditions, especially ice, require the most precision in being forward and engaging the ski tips early (but gently). The boots influence the ability to get forward significantly, see Ski Boot Fitting and Ski boot setup. The boots and binding setup should be aligned properly fore/aft (including forward leaning angle of the cuff, cuff height, heel height, delta and ramp angles etc) alas, this type of alignment is also the hardest to get at the average boot store and it can even change from ski to ski (as the bindings may be different). Contrary to popular opinion, one does not need to flex the boot to get forward, if the boots are properly setup. If you have to flex the plastic shell of the boot every time to feel forward and in balance, then the boots are not properly aligned fore/aft and, to put up with them, they are also likely too soft. Don't confuse being forward with applying pressure to the tips. Although there is some obvious forward pressure, being forward is simply a state where you can apply pressure to the tips and, simply being forward does not imply or require a lot of pressure on the shins from the boot tongues. While applying the pressure however, there can be significant pressure on the shins! Member-only content avilable (365 words). Do we need to be forward? YES. 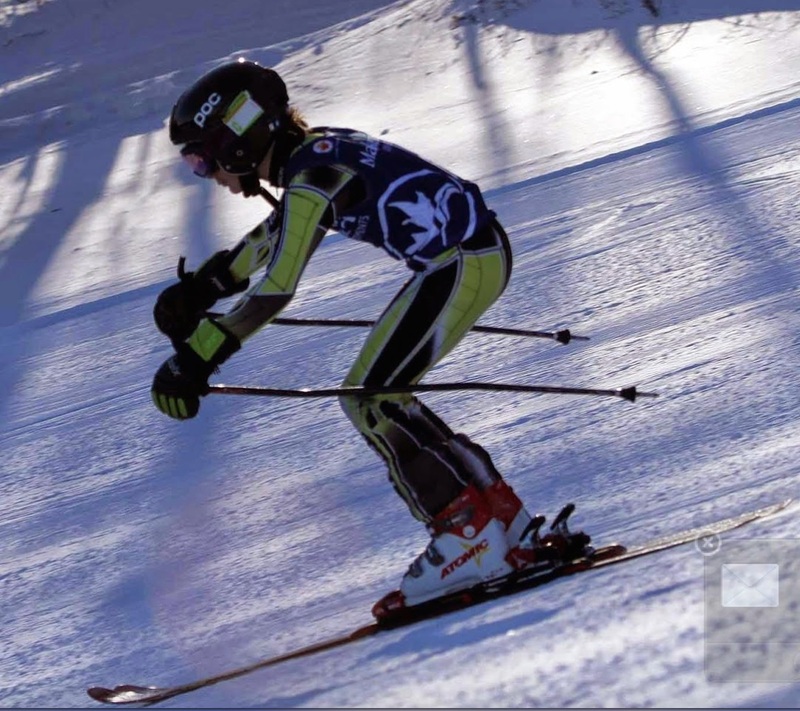 With today's high-tech easy-to-ski equipment, many promote a "centered" stance, but all performance skiers start the turns forward. This is how you get to use the entire ski, this is how we engage the tip and get it to perform. So, getting forward means we need to recenter and get our hips on top of the boots at the beginning of the turn. While we like that control for most of the turn, we don't like staying there for the entire turn. Viewed 931 times ( | Print ) this page.